Poly (ether-block-amide) /poly (ethylene glycol)/ carbon nanotubes mixed matrix membranes have been successfully fabricated using solvent evaporation method to determine the effect of ethylene oxide groups on the performance of produced membranes. The effects of CNTs (2-8 wt%) and PEG (up to 50 wt%)were investigated in both single and mixed gas test setup in different temperature and pressure. Finally the membranes were structurally characterized using Scanning Electron Microscopy, X-Ray Diffraction, Fourier Transform Infrared Spectroscopy, and Atomic Force Microscopy. Results showed that addition of carbon nanotubes enhanced the gas separation performance of membranes and presences of ether groups in poly ethylene glycol improved the CO2 permeability. Membrane containing 8 wt % carbon nanotubes and 50 wt % poly ethylene glycol showed the best performance with CO2/CH4 selectivity of 45 and CO2permeability of 302 at pressure of 14 bars. Also, mixed gas permeation experiments were carried out and results showed dramatic decrease in CO2 selectivity due to membrane plasticizing. The permeability of CO2 in mixed gas test for membrane containing 50 wt% pol ethylene glycol and 8 wt% was 193 with CO2/CH4 selectivity of 19 in room temperature. Furthermore, membranes produced by 6 and 8 wt% carbon nanotubes and 50 wt% poly ethylene glycol placed above Robeson’s trade-off line. The effect of temperature on performance of fabricated membrane was finally investigated. Results showed an increase in permeability and decrease in selectivity for all membranes. P.D. Sutrisna, J. Hou, H. Li, Y. Zhang, V. Chen, Improved operational stability of Pebax-based gas separation membranes with ZIF-8: A comparative study of flat sheet and composite hollow fiber membranes, J. Membr. Sci. 524 (2017) 266–279. M.N. Nejad, M. Asghari, M. Afsari, Investigation of carbon nanotubes in mixed matrix membranes for gas separation: a review, ChemBioEng Rev. 3 (2016) 276-298. K. Li, H. Liang, F. Qu, S. Shao, H. Yu, Z. shuang Han, X. Du, G. Li, Control of natural organic matter fouling of ultrafiltration membrane by adsorption pretreatment: Comparison of mesoporous adsorbent resin and powdered activated carbon, J. Membr. Sci. 471 (2014) 94–102. 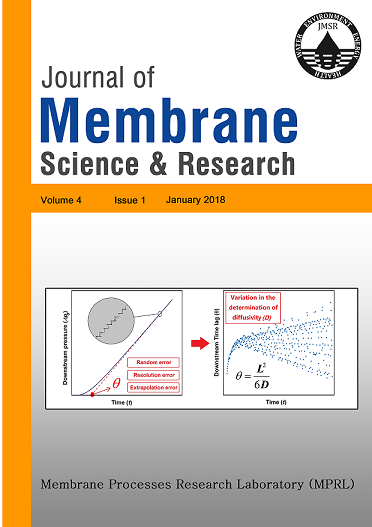 D. Zhao, J. Ren, Y. Wang, Y. Qiu, H. Li, K. Hua, X. Li, J. Ji, M. Deng, High CO2 separation performance of Pebax®/CNTs/GTA mixed matrix membranes, J. Membr. Sci. 521 (2017) 104–113. B. Freeman, Y. Yampolskii, Membrane gas separation, John Wiley and Sons, Ltd., west Sussex, UK, 2010. S.M. Fatemi, M. Foroutan, Review on carbon nanotubes and carbon nanotube bundles for gas/ion separation and water purification studied by molecular dynamics simulation, Int. J. Environ. Sci. Technol. 13 (2015) 457–470. H. Susanto, A.M. Samsudin, N. Rokhati, I.N. Widiasa, Immobilization of glucose oxidase on chitosan-based porous composite membranes and their potential use in biosensors, Enzyme Microb. Technol. 52 (2013) 386–392. H. Lin, B.D. Freeman, Materials selection guidelines for membranes that remove CO2 from gas mixtures, J. Mol. Struct. 739 (2005) 57–74. I. Khalilinejad, H. Sanaeepur, A. Kargari, Preparation of poly(ether-6-block amide)/PVC thin film composite membrane for CO2 separation: effect of top layer thickness and operating parameters, J. Membr. Sci. Res. 1 (2015) 124–129. S. Wang, Y. Liu, S. Huang, H. Wu, Y. Li, Z. Tian, Z. Jiang, Pebax-PEG-MWCNT hybrid membranes with enhanced CO2 capture properties, J. Membr. Sci. 460 (2014) 62–70. N. Azizi, T. Mohammadi, R.M. Behbahani, Synthesis of a new nanocomposite membrane (PEBAX-1074/PEG-400/TiO2) in order to separate CO2 from CH4, J. Nat. Gas Sci. Eng. 37 (2017) 39–51. V.I. Bondar, B.D. Freeman, I. Pinnau, Gas transport properties of poly(ether-b-amide) segmented block copolymers, J. Polym. Sci. Part B Polym. Phys. 38 (2000) 2051–2062. K. Okamoto, M. Fujii, S. Okamyo, H. Suzuki, K. Tanaka, H. Kita, Gas permeation properties of poly(ether imide) segmented copolymers, Macromolecules 28 (1995) 6950–6956. B. Garzo, L.F. Rull, Computer simulation of vapor-liquid equilibria of linear dipolar fluids: Departures from the principle of corresponding states, J. Chem. Phys. 102 (1995) 7204–7215. N.P. Patel, M.A. Hunt, S. Lin-Gibson, S. Bencherif, R.J. Spontak, Tunable CO2 transport through mixed polyether membranes, J. Membr. Sci. 251 (2005) 51–57. S. Sridhar, T.M. Aminabhavi, S.J. Mayor, M. Ramakrishna, Permeation of carbon dioxide and methane gases through novel silver-incorporated thin film composite pebax membranes, Ind. Eng. Chem. Res. 46 (2007) 8144–8151. A. Car, C. Stropnik, W. Yave, K. V. Peinemann, PEG modified poly(amide-b-ethylene oxide) membranes for CO2 separation, J. Membr. Sci. 307 (2008) 88–95. H.W. Yen, Z.H. Chen, I.K. Yang, Use of the composite membrane of poly(ether-block-amide) and carbon nanotubes (CNTs) in a pervaporation system incorporated with fermentation for butanol production by Clostridium acetobutylicum, Bioresour. Technol. 109 (2012) 105–109. T. Wu, N. Wang, J. Li, L. Wang, W. Zhang, G. Zhang, S. Ji, Tubular thermal crosslinked-PEBA/ceramic membrane for aromatic/aliphatic pervaporation, J. Membr. Sci. 486 (2015) 1–9. S. Liu, G. Liu, X. Zhao, W. Jin, Hydrophobic-ZIF-71 filled PEBA mixed matrix membranes for recovery of biobutanol via pervaporation, J. Membr. Sci. 446 (2013) 181–188. H. Cong, J. Zhang, M. Radosz, Y. Shen, Carbon nanotube composite membranes of brominated poly(2,6-diphenyl-1,4-phenylene oxide) for gas separation, J. Membr. Sci. 294 (2007) 178–185. J.P. Sheth, J. Xu, G.L. Wilkes, Solid state structure-property behavior of semicrystalline poly(ether-block-amide) PEBAX® thermoplastic elastomers, Polymer 44 (2002) 743–756. S. Wang, Y. Liu, S. Huang, H. Wu, Y. Li, Z. Tian, Pebax–PEG–MWCNT hybrid membranes with enhanced CO2 capture properties, J. Membr. Sci. 460 (2014) 62–70. S.G. Lovineh, M. Asghari, G. Khanbabaei, CO2 permeation through poly(amide-6-b-ethylene oxide)-nanosilica membranes, Appl. Surf. Sci. 318 (2014) 176–179. S. Liu, G. Liu, J. Shen, W. Jin, Fabrication of MOFs/PEBA mixed matrix membranes and their application in bio-butanol production, Sep. Purif. Technol. 133 (2014) 40–47. K. Nath, Z.B. Maroulis, D.S. George, Membrane separation processes, Food Process Des. 8 (2008) 336-338. X. Zheng, Q. Xu, Comparison study of morphology and crystallization behavior of polyethylene and poly(ethylene oxide) on single-walled carbon nanotubes, J. Phys. Chem. B. 114 (2010) 9435–9444. M. Asghari, A. Mahmudi, V. Zargar, G. Khanbabaei, Effect of polyethyleneglycol on CH4 permeation through poly(amide-b-ethylene oxide)-based nanocomposite membranes, Appl. Surf. Sci. (2014) 218–222. N.N. Li, A.G. Fane, W.S.W. Ho, T. Matsuura, Advanced membrane technology and applications, John Wiley & Sons, WS, UK, 2008. Y. Li, T.-S. Chung, Molecular-level mixed matrix membranes comprising Pebax® and POSS for hydrogen purification via preferential CO2 removal, Int. J. Hydrogen Energ. 35 (2010) 10560–10568. V.I. Bondar, B.D. Freeman, I. Pinnau, Gas sorption and characterization of poly(ether-b-amide) segmented block copolymers, J. Polym. Sci. Part B Polym. Phys. 37 (1999) 2463–2475.